Distributed Memory Processing (DMP) will be available for dynamic explicit analysis in ADINA 8.5. 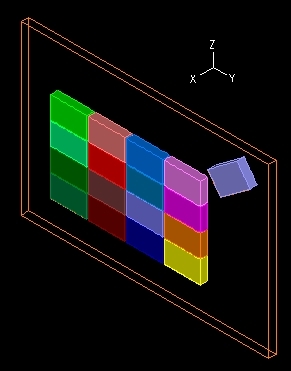 The calculations of element forces, displacements and contact conditions are all distributed to the multiple processors according to the computing domains. This leads to significant reductions in solution time and memory requirements compared to a single domain, single processor run. Of course, the results are independent of the number of processors/domains used. We present here three examples to show the effectiveness of the DMP ADINA version. The examples have been run with 1 to 8 processors/domains. The first example is a contact intensive one involving impact between multiple 3D blocks enclosed in a rigid area. 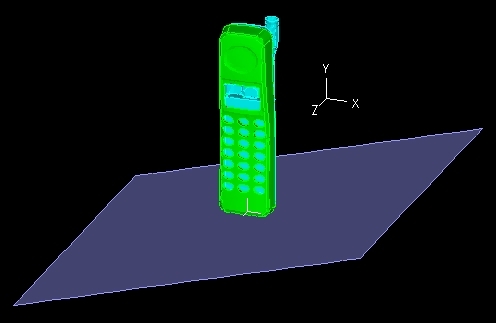 The second example is a phone drop test. The third example involves a steel ball impacting and punching through a thin plate. The figure below shows the speedups currently obtained in the solutions of the three problems. It is clear that in all cases a significant speedup is achieved for 2, 4 and 8 domains. The movie above shows the deformation of the ball plate impact problem highlighting the domain splitting (for 8 domains). Note that the explicit-dynamic analysis of problems is provided within the "ADINA philosophy" of only using reliable elements and analysis techniques. Hence in explicit analysis the same elements are used as in implicit analysis. The cost of an explicit time-marching solution using ADINA will therefore frequently be significantly higher than with other explicit codes, however we shall continue to focus on making the ADINA explicit-dynamic solution as effective as possible within the ADINA philosophy. Also, using the same elements for explicit and implicit time-marching solutions enables directly restarts from an implicit to an explicit solution, and vice versa. The example solutions shown were all obtained on a cluster consisting of four HP x86_64 workstations with dual 1.8 GHz Opteron processors, running Red Hat Enterprise Linux Version 4 and HP MPI Version 2.02.05. Clearly, the ADINA DMP capability in explicit time-marching solutions will be very complementary to the static and implicit-dynamic ADINA solution capabilities, and make ADINA a more effective tool for many crash-type problems. A forthcoming News will focus on the new ADINA DMP capabilities for static and implicit-dynamic solutions.